19. Halerpestes Greene, Pittonia. 4:207. 1899-1901. Ovezinnikov in Komarov, Fl. URSS. 7: 329-331. 1937. Naturhistorisches Museum, Botanische Abteilung, Wien, Austria. Small perennials with basal leaf ros ettes producing 1-3-flowered scapes and long, slender creeping shoots which reproduce vegetatively. Flowers yellow. Sepals 5. Petals 5-12, about the same length as the sepals or longer. Stamens numerous. Carpels numerous, forming 1-seeded, achenes with a short straight or recurved beak and longitudinal veins. A small genus of about 6 species, which was previously included in Ranunculus, but seems to be closely related to Oxygraphis or the American genus Cyrtorhyncha. Most or all the species seem to be halophilic and prefer more or less muddy ground. They are widely distributed in Northern, Central and E. Asia and in the extratropical parts of the Americas. Represented in Pakistan by 1-2 species. Halerpestes lancifolius (Bertol.) Hand. -Matz. Ranunculus lancifolius Bertol. = Halerpestes lancifolius (Bertol.) Hand. -Matz. 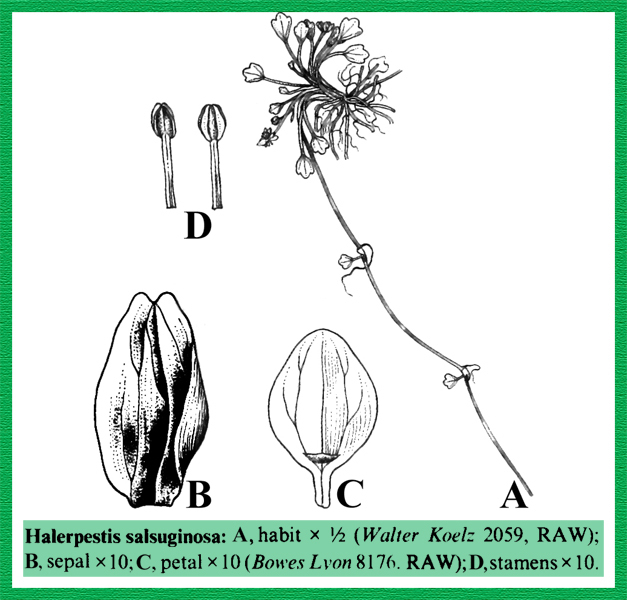 Ranunculus palifolius Dunn = Halerpestes lancifolius (Bertol.) Hand. -Matz.